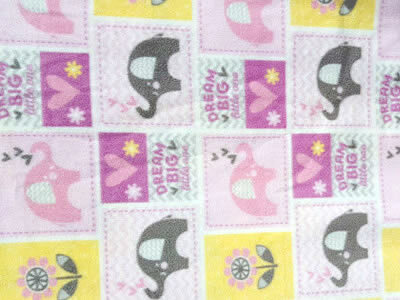 Dream Big Pink is a fluffy 100% polyester fleece wrap in soft pink, yellow and white. Large panel squares contain the Dream Big message, as well as pink elephants, gray elephants, and flowers on a pale pink or yellow background. Easy machine wash & dry. Trimmed in pale pink. Available in two sizes: Newborn fits infants up to 27" long (approximately 6 months); Large fits infants up to 34" long (approx. 12 months). Handmade in the USA with imported fabric. Free Shipping in the USA!